The inner west of Sydney has been a key battleground at NSW state elections since at least 2003, when the Greens first made a serious attempt to win the seats of Port Jackson and Marrickville. Yet something has changed this year, with the focus shifting elsewhere. There was some (incorrect) speculation about Balmain being in play, but the Greens’ marginal seats were all on the north coast. As today’s post I have created a map showing the booth results across three inner-west electorates: Balmain, Newtown and Summer Hill. The first two are now held by Greens MPs by 60% or more, while Labor’s Jo Haylen holds Summer Hill with almost 70% of the two-candidate-preferred (2CP) vote. While there are some demographic differences between Summer Hill and its neighbours to the east, they are more similar, particularly in suburbs like Marrickville, Summer Hill and Dulwich Hill. The first map shows the 2CP swing by booth between Labor and the Greens. It is remarkable how almost every booth in Newtown and Balmain has swung towards the Greens, while there are big swings towards Labor just across the border. There is variety in how big the swings were. Jenny Leong got little to no swing in the centre of her electorate, but gained big swings in the Redfern/Surry Hills area. You can then toggle maps to show the 2019 result by booth, and you’ll see that there are practically no booths where the winning candidate polled less than 60%. You can also toggle the map to see the 2015 result, and while the winning party in most booths is the same, the margins are much smaller. Obviously it’s hard to say exactly why this is happening, but I suspect some of it is a strengthening of sitting MPs. It’s often been said about rural electorates that the sitting MP is more important than in urban seats. I suspect there is a similar dynamic in these seats, where highly-educated voters are aware of the electorate they live in and who the local member is, and would likely vote differently if they crossed the boundary. There may also be campaign and candidate effects – the Greens definitely put a lot less resources into Summer Hill than into Newtown. That may change in the future – Summer Hill is probably still the Greens’ best chance to gain a third seat in the Sydney region. On the one hand it will be easier to extend their campaign now that Balmain and Newtown have become so safe, but Jo Haylen’s strengthened position will make a Greens campaign harder in 2023. It’s curious to compare the trajectories of Balmain and Drummoyne: adjacent seats, but one now firmly in the Lib camp, while the Libs have more or less given up on Balmain, having come first in the FP vote in 2011. The Redfern backing the Greens is a phenomenon easily observed elsewhere. If a seat has a rapidly divided voter base on each end, one end will join the other if the seat swings to a different party. This is comparable to the seats of Northcote and Richmond in Victoria. 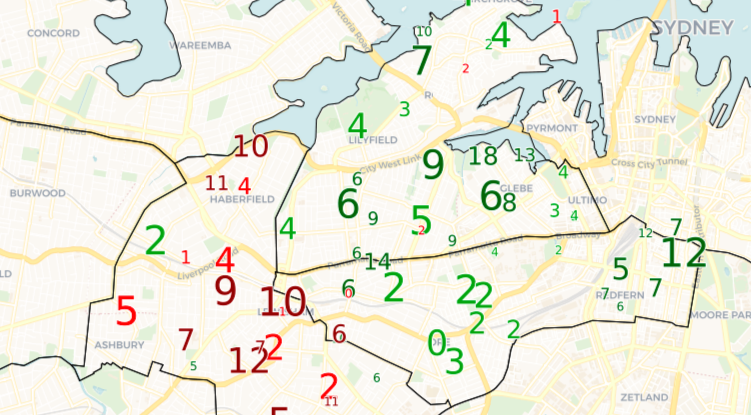 As a member (or candidate in the case of Richmond) gains profile, the electorate tends to even out (see the Richmond booths swinging strongly to the Greens in 2014 where the Fitzroy booths stayed flat) and Northcote where the Green vote has continued to rise and even out in the Thornbury and Fairfield end, even as the electorate has ebbed and flowed between members. Is there a phenomenon that explains this and Adam Bandt 2013 I wonder? Elections where there were swings against the Greens but not the actual Greens in parliament? Similarly, compare Ballina to Lismore. Rebekah Sharkie holding Mayo while her party tanks in polling and the state election is similar. So I guess just extreme incumbency advantage for minor party candidates? It should also be mentioned that in Summer Hill Jo Haylen has a strong reputation as a visible and very progressive Labor MP, the type of candidate Labor should be preselecting in these seats. She would have gained a big boost from incumbency – the Greens actually fell back into 3rd place in this seat. As far as I’m concerned, as long as Jo Haylen is the Labor MP in Summer Hill the Greens will be unable to pick up the seat. She is too visible, well likely and progressive for the greens to really pose a substantial threat. The same rally applies to Jenny Leong in Newtown, where personal popularity will carry her until retirement. These are all seats where the incumbent is favoured, and that is a trend which is more so the case. I suspect that the main reason that the swings were towards the incumbents were that swing voters not wanting the Coalition voted for the incumbent anti-Coalition candidate. Once there are incumbent ALP governments at both state and Commonwealth level, things will likely be different. It’s always fascinating how some neighbouring seats can vote so differently to one another, especially those tightly packed ones in the middle of cities. You’d think there’d be a more gradual shift from Green to Labor to Coalition etc areas. Northern NSW is another example of this. You’ve got Ballina which is the most left wing/progressive/Greens friendly rural/regional area in the country, then just a few minutes up the Pacific Highway you cross into a Nationals area in Tweed and a Liberal/conservative area across the QLD border on the Gold Coast. Another hour or so will get you to Ipswich and the seat of Oxley, which of course was won by the gun loving racist Pauline Hanson all those years ago. Such a dramatic shift from Greens heartland to One Nation heartland all in a relatively small geographic area. I live right on the “dividing line” between the two inner wests, and have commented on it before… I’m also probably guilty of the speculation Ben mentioned that “Balmain was in play” by reporting some of the laughably inaccurate reports that appeared in the Herald (I never believed them, btw). Even though I didn’t predict the swing to the Greens in Balmain and Newtown, I did at least tip this divide correctly – Balmain and Newtown – Grns retain, Drummoyne – Lib, Summer Hill – Lab. Its easily explained: Demography and economics. Housing in the inner ring (Balmain and Newtown) is now out of reach for all but the wealthy, and its residents (using the local council – mostly the newly amalgamated Inner West one) have adopted a siege mentality to any new supply. Nimby anti-development sentiment and is just about the only “religion” left in this area, and the Greens are its most fervent preachers. This has the effect of forcing existing prices upwards, something most of the activists know only too well. Consequently, very few immigrants and younger people can gain foothold here. Over the years the area has both aged and become more Anglo – the sons and daughters of its original European migrants have cashed in and moved out. They’re replaced by baby boomers downsizing from the North Shore and other outer suburbs, and two income professionals – usually highly paid “knowledge workers.” Both groups tend to be Greens voters. The LGAs of Canada Bay, Burwood, Strathfield and the old Ashfield (now amalgamated) adopted a very different policies to housing supply, and allowed immigrants from Asia and elsewhere to move in. Prices for apartments in these LGAs are are still relatively high (especially the waterfront ones), but the ethnic demographic shifts have been quite dramatic in the time I’ve lived here. These newly arrived inner westies tend to be more socially conservative and economically aspirational. In Drummoyne (my seat), the Greens vote fell, something I (shucks) accurately tipped. It declined even more dramatically in Summer Hill (there may have been a couple of additional factors here), and it will continue to decline – from the Iron Cove Bridge to Rhodes. But in Balmain and Newtown, the Greens are now an entrenched part of the “new establishment”. And they are probably there for good. There has been a major gentrification in Dulwich Hill / Hurlstone Park. Get off the train at either station in the evening and there are now crowds of young professionals and affluent families. Not sure how this affects the politics. Could almost imagine a shift towards the Liberals. Ted, your analysis definitely explains the broader demographic differences between the inner inner west and the outer inner west but it doesn’t explain such a dramatic difference between Petersham and Stanmore on one side and Marrickville, Dulwich Hill and Summer Hill on the other. Jo Haylen campaigned so hard on what she called “over-development” she sucked all the oxygen out of the Greens position on this issue. She actually managed to out-Nimby them, something I thought was impossible. Someone above labelled her “progressive” and that may be what they mean. Incredibly, she even opposed (this is Labor policy) the upgrade of the Bankstown rail line. This is what being “progressive” means to many in the inner west – that you are opposed to progress. On the other side of the divide, Jenny Leong is now extremely well-known – anyone who even vaguely follows the news will have heard of her. Especially if they listen or watch the ABC (they adore her, and fair enough, most of the ABC Ultimo staff probably live in her electorate). Some of the news was fairly negative – her recent use of parliamentary privilege for a factional hit job raised quite a few eyebrows – but the old maxim, “all news is good news” certainly applies here. She has name recognition, Labor’s “Auntie Norma” did not. The swings to her around the Redfern end of the electorate can be be explained by the fact that its the area undergoing the most recent gentrification. I know someone who just bought a house at an eye-rolling price near the station near what used to be a “no-go” area. He’s a barrister, and his partner is equally well-paid. He told me he was voting Labor, but that was before Daley revealed his true self… I suspect he changed his mind after that.